Sadly this tour has once again had to be postponed because we now know that none of the Rio Grande Scenic RR’s four steam locomotives is operational this year. This information comes from a very reliable source – not the Railroad itself, from whom we have heard nothing! but from Mr. Loring Lawrence of Manchester, New Hampshire – one of our regular correspondents and someone who many of you may know. There are no guarantees that any of the locos. will be repaired in time for the 2016 “fall”, but we understand that it is a distinct possibility, so the itinerary below is tentatively kept in our programme unless or until we find out differently. We have always had a soft spot for Colorado, with the Durango & Silverton and Cumbres & Toltec railways, plus various other lines, like Cripple Creek, and the Georgetown Loop, and we have covered it both in the winter, and in June – both excellent times for photography. But this time we will be enjoying the spectacular colours of Autumn, on this tour which will cover both regular workings and photo charters. Hopefully we will have steam trains on the Alamosa – La Veta line, and for modern traction enthusiasts we will spend a day observing and photographing the constant processions of BNSF trains in the Colorado Springs/Palmer Lake area or through the small town of Walsenburg. Colorado in the “fall” is a beautiful place to be, and whilst the United States of America is a mighty big country, there is plenty of steam – relieved by a little modern traction – within the confines of the state of Colorado (plus a bit of New Mexico) to keep most enthusiasts very happy indeed – and the relative strength of the Pound against the U.S. Dollar makes for a reasonably inexpensive trip. 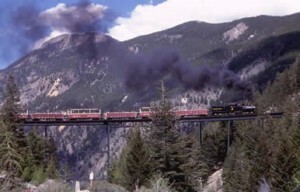 This tour spends two days on each of the “main” lines – Durango & Slverton, Cumbres & Toltec, and Rio Grande scenic railway at Alamosa – one for riding, and the other for chasing by road (a photo-charter on the RGSRR) to get to the classic locations In addition, visits to the Georgetown Loop RR (whose “Shay” has returned); the Colorado Railway Museum at Golden, and the Cripple Creek RR and Pikes Peak rack railway, with a number of static preserved locos. to be seen during our drives; and for a complete change, time on Union Pacific’s busy Sherman Hill route, and the BNSF/UP “Joint Line” at Colorado Springs/Palmer Lake/Walsenburg. Colorado Railway Museum at Golden (optional visit to Coors Brewery - free tours and tastings!) and on to Georgetown Loop RR. North to Wyoming for heavy diesel freights on UP’s Sherman Hill route - double, triple and even quadruple-headers! Visit en route to Great Western Railway’s depot at Loveland - a typical US “short line”. Visit preserved 4-8-8-4 “Big Boy” in Cheyenne, Cooke 1890 4-6-0, the Fort Collins tram on return, and more. Full day drive over mountain passes (c.10,000ft) to Durango. Several preserved steam locos. en route, and possible short trip (diesel) Leadville - Climax. Full day Durango & Silverton RR - return on the train. Full day Durango & Silverton RR photographing by road (optional riding own expense). Evening drive to Chama, New Mexico. Full day Cumbres & Toltec RR - train riding options included. 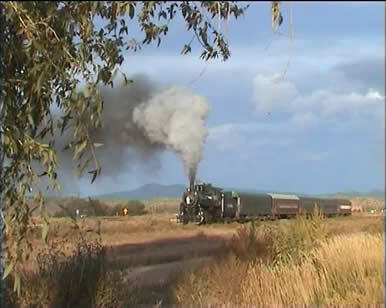 Full day Cumbres & Toltec RR photographing by road (optional riding - own expense). Visit depot, works;late p.m. drive to Alamosa. Full day photo charter on Rio Grande Scenic Railway (below, left) Alamosa - La Veta return. Visits to Cripple Creek & Victor RR and Pikes Peak funicular RR en route to Castle Rock for overnight. To Denver; Afternoon flight to London Heathrow - Arr. approx. 11:00 Tuesday Sept. 30. Tour price approx. Incl. return flights London/Denver, road transport using 7-seat Ford Galaxy or similar (max. 5 persons per vehicle); Hotel accommodation on room-only basis (although complimentary breakfast normally available in lobbies); Fares for train rides on all the major lines described, and all necessary visit/photo permits, £1,895 – single room supplement £290. A deposit of £200 will secure your place (but only once we have had it confirmed that steam will be running on the RGSRR).